NEO GROUP sustainability work was awarded Gold rating and achieves a higher rating than last year. The independent review results put NEO GROUP on the TOP one percent of all suppliers audited worldwide across a wide range of industries. It is becoming more apparent that companies are choosing suppliers and partners based on their reliability and sustainability efforts. Therefore, the rating of independent auditing company EcoVadis, which is strict, unified and has clearly understandable criteria, strengthens transparency and long-term cooperation of our company. 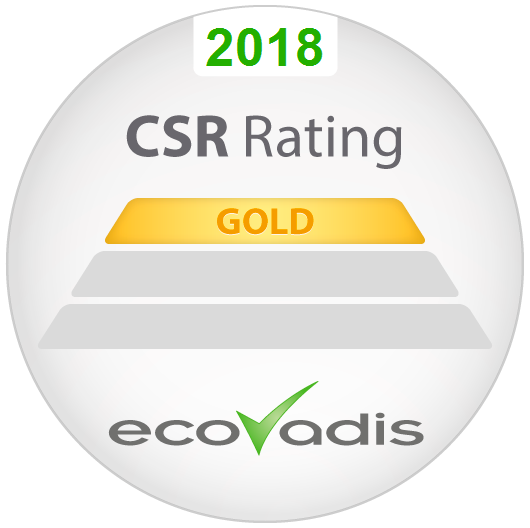 EcoVadis provides sustainability ratings for world-class supply chain organizations such as Coca & Cola, BASF, Johnson & Johnson, Nestlé, Renault and others. More than 30 thousand companies were assessed and rated by EcoVadis according to various criteria in Environment, Fair labor & human rights, ethics, and sustainable procurement themes. Their methodology is built on international CSR standards including the Global Reporting Initiative, the United Nations Global Compact, and the ISO 26000, covering 150 spend categories and 140 countries. The independent review results put NEO GROUP on the TOP 1% of all suppliers audited worldwide across a wide range of industries. To reach EcoVadis’ Gold rating, companies must score between 62 and 100 on their scale. NEO GROUP achieved 69 points and it‘s an increase from the 61 points achieved in 2017. EcoVadis evaluated NEO GROUP’s policies, actions and results across its production facilities with the special focus on environment protection and fair labor practices. “This is a great news for both us and our customers, because sustainable development is an integral part of the NEO GROUP’s work, while strict and independent EcoVadis audit confirms that we are performing in the most effective and responsible way possible”. Environment: in the TOP 2 % of suppliers assessed by EcoVadis in this category. Labor Practices: in the TOP 23 % of suppliers assessed by EcoVadis in this category. Fair Business Practices: in the TOP 3 % of suppliers assessed by EcoVadis in this category. Sustainable Procurement: in the TOP 7 % of suppliers assessed by EcoVadis in the category. Overall: in the TOP 2 % of suppliers assessed by EcoVadis in this category.